Southgate Physio offers revolutionary Theraflex treatment services to effectively treat neck and back pain. Do you want quick relief from your back, neck or shoulder pain? Theraflex – a revolutionary approach to spinal mobilisation – can give you instant respite. We, at Southgate Physio clinic, are glad to introduce this new and unique treatment in our physiotherapy practice. Theraflex is a treatment that consists of the use of specialised equipment called EPVM 1 Vertebral Mobiliser. The EPVM 1 Vertebral Mobiliser is the first piece of contraption that enables a physiotherapist to enhance movement and activate individual segments of the spine. It is a new treatment that takes spinal mobilisation to a whole new level and amplifies the mobility of the spinal column. Even though it allows a degree of improvement that is not possible with the human hand, it allows our physiotherapists to maintain the control and feel of manual therapies. Physical mobilisation or manipulation of spinal joints has been accepted by physiotherapists, chiropractors and osteopaths to be the ideal treatment to fix mechanical spine disorders. Theraflex only does it better by enabling movement generation between the individual vertebral segments. The Theraflex or EPVM 1 handset has four feet that are effectively spaced, so that they align with the transverse processes of the vertebra when lying across the axis of the spine. 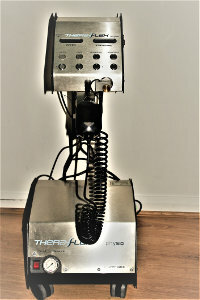 The Theraflex treatment unit makes use of compressed air to move 2 pairs of alternating pistons, which is equal to having 2 pairs of hands simultaneously working on the spine. This allows for more thorough and quicker mobilisation of the spine than what is possible for a single physiotherapist working with just his/her hands. The speed and pressure at which the pistons move can be completely controlled by the operator. This enables the possibility of variable treatments including gentle massage to ease muscle tension, strong mobilisation and articulation of the vertebral segments and more. Furthermore, the treatment depends on the settings that have been selected by the therapist. Also, the machine can only exert force, if the operator applies the same amount of force. What are the Uses of the Treatment? Theraflex treatment is used for providing relief to patients suffering from disc problems like, bulging, slipped, torn or herniated discs in the lower (lumbar) or neck (cervical spine). The treatment is also used to help with problems and injuries, such as muscle strain, sports related back pain, prolapsed disc and more. The Theraflex system helps in applying the right amount of force on the fixed joints and causing immense relief. It helps to restore the balance between strength and supple elasticity throughout the spine. The treatment de-stresses the spinal joints in the lower back and neck. To know more about our Theraflex treatment, give our expert therapists a call on 02083686767 or have a visit to our Southgate Physio Clinic North London.